Pairing a beautiful silk blouse with some high-waisted, or high rise cigarette dress pants automatically gives off a feminine vibe within the workplace. Sticking to a navy, black, grey suit everyday can drag down the personality of the individual. I opt for this beautiful pink and white silk blouse (that I just bought) and some crisp, creased white skinny dress pants. For the dress pants: they need to remain work appropriate even though they are skinny pants. They should fit, not suffocate the bum. A beautiful bright green, almost kelly green, really adds a pop but not too outrageous since it is still the workplace. This particular purse is actually from ShoeDazzle.com but there are very similar totes from Hermes’ Birkin line and I have seen one by Brahmin but without the lock accent. I completely agree on this beautiful green (almost a kelly green) being perfect for spring. 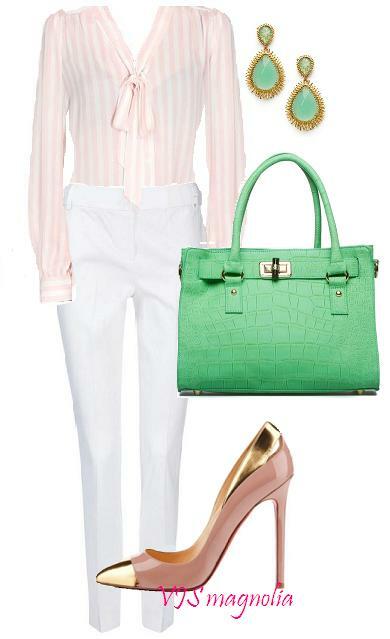 It is such a complimentary to the soft pink in this look.